This entry was posted in Children, Humor, laugh, Laughter, Parenting, Parents, Southern Living, Step Parenting, women and tagged dance, dresses, fashion, formal, high school, prom, stripper, underage. Bookmark the permalink. Too funny! About 5 years ago, I went shopping for Christmas gifts for Ginny’s girls. I called her and asked where she bought clothes for them because I had been at the mall and every store might as well be called Sluts R Us! Luckily Nordstrom saved the day. Hee hee, Hos ‘R Us. I’m always appalled by looking at the selection of sparkly one-shoulder tops available for 8-year-olds – they’re shirts I’d pick up from Forever 21 for a night at the bar…if I wasn’t 31 and 20 lbs overweight LOL. Your friends are always so smiley. The pic above proves that! Omg – this is too funny! 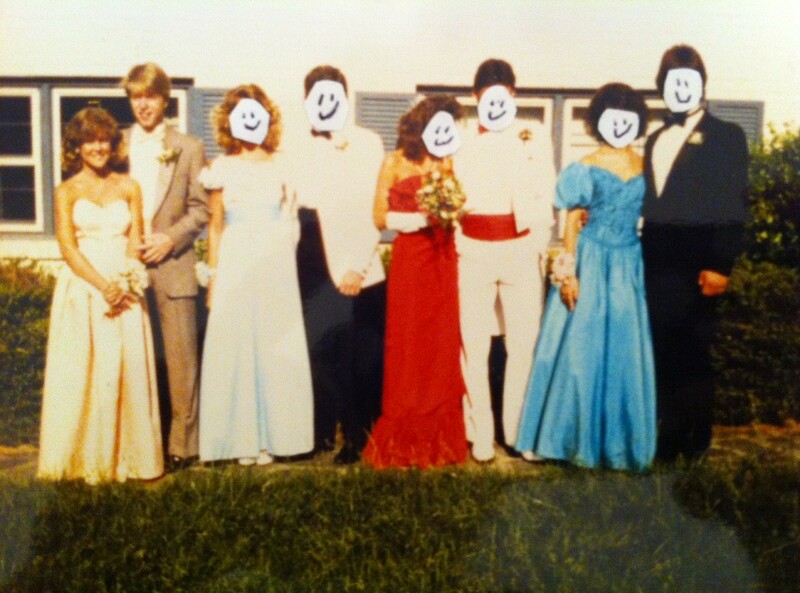 I think I also went to prom in 1986! Great memories. The 80’s were so cheesy but I think that is one of the things that was so great about it! This is absolutely hilarious!!! One of my daughters graduated from high school in ’86….I will have to share this with her. I read it over an hour ago, and I am still laughing….thanks….I needed that!!! 🙂 Love your humor….can hardly wait for the next one! !